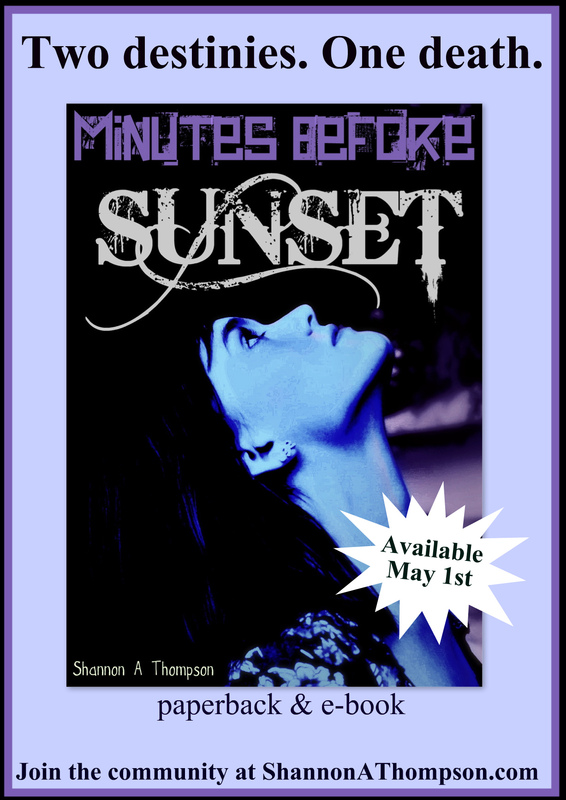 10 days before the Minutes Before Sunset release (AEC Stellar Publishing) ! 1. Readers: There’s no mistake that they are my number one is my list. Readers are vital to an author’s ultimate success. A writer could have the best publishing team for their story available, yet if they don’t have a relatable and entertaining story, an author won’t make it. The readers, in the end, decide, and that’s why I really suggest connecting with your fans as much as possible. Have an email they can send you messages, questions, and reviews too. Connect with them on all the websites below (don’t force them to join, but rather connect with the ones that are already on the sites.) Create a Facebook page they can follow (since many don’t feel comfortable sharing their personal Facebook, and I completely agree with that.) and talk to them on there. Figure out what they like and what they didn’t like about your book. Be willing to change. Be even more willing to help them change by supporting their dreams to become a writer or something else entirely. Personally, I love searching around the web for fellow writers, readers, and bloggers. I follow their blogs, and I often like or comment on material. That way, I find readers, rather than expect them to come to me, and I don’t expect them to follow back. They can reciprocate or not, because I’m coming to them as a reader (not a marketing writer) and respecting their work. If they check me out, and decide to support me, that’s great! Oh! And never stop writing. Even if you’re drenched in monsoon rain in the middle of an airport. 2. Internet: Join as many social networking sites as possible for both yourself and your work. If you click any of the website below, you’ll be taken to my personal page, but you can see how authors and readers can connect through these communications. You can even join, too! Have a blog: If you don’t have a publisher yet, you’ll surely run into this in the future. Blogs are essential in connecting with readers, so you’ll almost be expected to have a website. If you don’t already have one that you keep updated on a regular basis, I’d suggest creating a page with a blog. I update mine (this very page) every two days (three if I’m having a particularly busy week) with information on entertainment, writing, and publishing. This allows my blog to be focused but also fun to write and fun for others to read. Facebook: No one can deny how popular Facebook has been over the past couple of years. Even when you create a new profile, you fill out your “likes,” and that’s where authors and books come in. 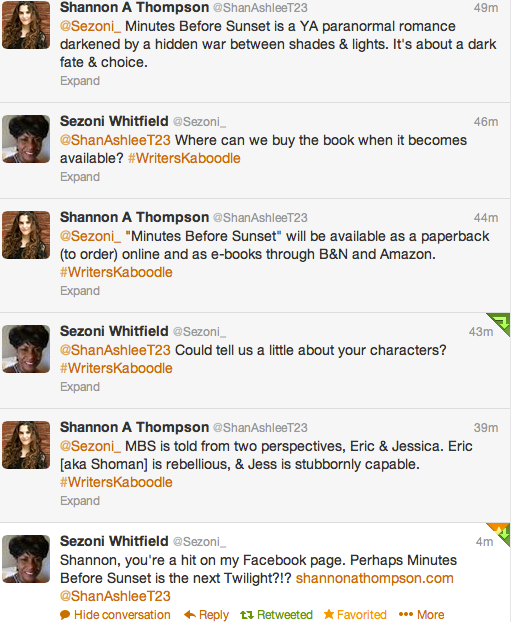 One part of my Interactive interview on Twitter with Sezoni Whitfield. Author Page: Create a page for only you. This way you can announce all of your books, events, and other announcements all on one page. Personally, my author page has the most activity, compared to my individual book pages. Twitter: Twitter is wonderful for finding writers and readers. Simply use a hashtag (#) and find anyone under the sun that is discussing the topics you want to connect with. I’ve also done an interactive interview on Twitter with Sezoni Whitfield, and I gained 200 followers in one days. Publisher’s page: If you have a publisher, be sure to include their page, information, and more contacts. This allows your readers to see what you’re up to professionally, and it also gives them the opportunity as writers to see how the situations differ and work. Goodreads & Shelfari: Both of these websites are focused on readers. It allows a place for readers to connect and discuss what they thought about a book. Add your novel to join in on the conversations which include reviews, favorite quotes, bookshelves, lists, and trivia. Amazon Author Central: For both published and self-published authors, you can control your author page on Amazon. This is wonderful, because you can connect it with your novels, blogs, Twitter, and Facebook. You can also announce events. Linked In: This is mainly for professionals you’ve connected with: publishers, agents, cover artists, editors, etc. But I recommend joining it, because you never know which one of those very types of people may come across your resume. All Author’s List: A free database that enhances your ability to appear on the internet. Think about the internet this way: the more you’re involved, the more likely your name will pop up on a Google search. Don’t hesitate to spread yourself across many social networking sites, because readers go to many different websites to find authors. Now that you’ve joined the World Wide Web, you can start sharing your name and news all over. Without going into extravagant details on all those websites again, however, I’ll give other opportunities. Find local businesses willing to support you. Print out flyers and share them with their customers. I have to thank Ice Fire Hookah in Shawnee, Kansas for doing this for me. It is very kind to know such a great group of people willing to support the arts. Dan Pantagram (April 16, 2013). Create Extras: This allows readers to interact with your work. I’ve talked about this before, so if you’re looking for ideas, visit my Extra’s Page. I also have 2 other extras coming this Wednesday ! Exchange Reviews: There are many authors like yourself that are wanting more reviews and buys. I’d suggest reviewing others’ works anyways, but if you don’t have a lot of time, I could understand why asking for them to exchange reviews is good. Try it out and see where you go from there. I know today’s post was tedious, but if you have any questions or want further elaboration, comment below, and I will surely get back to you! Those are really great tips, Shannon, especially for those of us who are still new at this. Thanks for another great post. Thanks for sharing your marketing tips! Good stuff. Connecting with other writers/bloggers I think is the most important one. I’ve seen a lot of blogs and twitter accounts where the author just constantly posts promos about their books, but never even bother to connect with other authors. It’s not hard, so if you’ve got a minute today, why not send a tweet/leave a comment for someone? Thank you so much for posting this it was extremely helpful! Most readers mustn’t like my book Albie Merani and the… Which has been making me sad. Reblogged this on M. L. Sexton. Thanks for sharing! And I’m glad you enjoyed it. This is a great article and very timely. I like to consider myself adept at social media, but learned a ton of new tips. Thanks! I appreciate you sharing as you learn! Thanks for sharing. Great help. Great tips. These are all excellent suggestions, Shannon! Thanks for taking the time to share them here. I’m planning to launch a Facebook page soon for my poetry and journalism work, and to start little teasers about my novel-in-progress. I just need to get the photo and banner squared away first. Good for you! I’m glad to help, and I hope your pages go well once you get those photos. One of my followers introduced it to me! Good tips! My mom is an author. She published one book and is working on number 2 now. Search Amazon for “The Gate Called Beautiful” it’s a story about her/my life. I don’t want to to spam your site with links, but she is on Amazon. Great advice! I sent her a link to your blog. Reblogged this on Editorial Stand. Hey thanks for this post. As someone who is a bit slow and simple when it comes to all things Internet and social media there were some really great tips on here I never would have known about. Cheers. This was full of great advice, thanks! Thanks. I forwarded this to my critique group (we’re all writers). Great advice on how to market from a fellow author & writer! 🙂 The lovely, talented & beautiful Shannon Thompson!